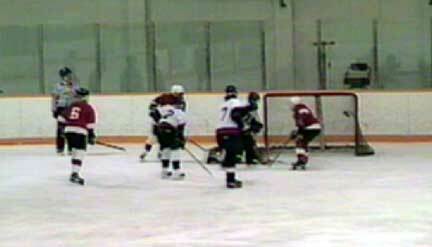 It may look like hockey and requires many of the same skills but Ringette is an entirely different sort of ice sport. Skating, situational positioning and passing make this game look and feel like the black rubber version but it has some elements that create extremely different scenarios. 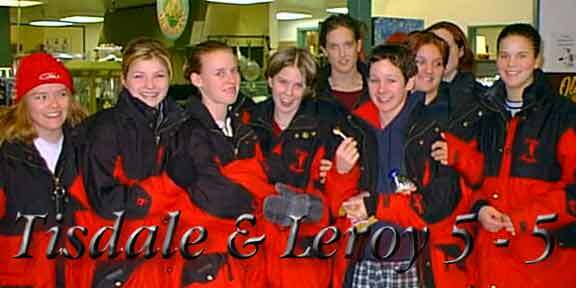 Tisdale's Rambler Ringette team met the Leroy Lazers Monday evening as they played to a five all tie. For this writer this was a whole new experience as the game's intricacies will take a good deal more then one viewing to understand. Since the game evolved with little available ice time the game must take place in only two periods and things have to keep moving. No time for lengthy line changes and face-offs. 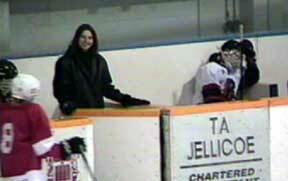 The ring is place on the ice one time designated to be in possession and the whistle indicates the beginning of play. 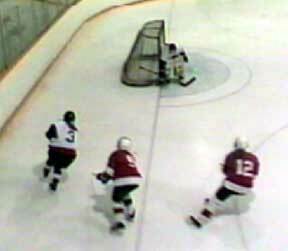 A frozen ring results in a swift return to action by one team being given what amounts to a free shot or the goalie given the ring to throw it into play. Body contact is penialised as is tripping but the real complexity in the game involves the lines. The ring must be passed over all blue lines and one third the way in from the blue line is the attack line and only three attacking players can be in that zone just as in the basketball key. These rules intended to speed up the game create an entirely different game strategy and Ringette is an amazingly face game. Cara Forer is one of the aggressive and accomplished players on the Tisdale team and was the first to earn a tripping penalty in Monday's game (seen at right). 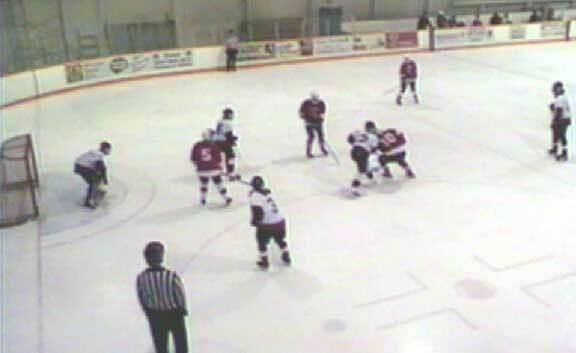 Both teams had only four extra players so the girls get lots of action in the short two period game. Leroy's coach is seen in the picture at right, Tracy Zentner Ochitawa, while Regan Will and Michelle Bue shepherd the Tisdale girls. picture just after she stole the ring from one of Leroy's leading scorers Derra Krieger. Last night's game was a quick series of goals and counter goals. In each of the five goals Tisdale would put one into Nicole Taphorn's net and within thirty seconds like a bunch of bees the Leroy team would come swarming back often lead by Tennille Hanson (10) or Jenny O'Neill and even things up. Twice during the game Tisdale's penalties cost them a goal but not immediately as Rachelle Nalepa did a remarkable job of giving the opposition nothing but posts and cross bars to shoot at. put their offensive plays into action with Kari Damm and Sarah Thompson. 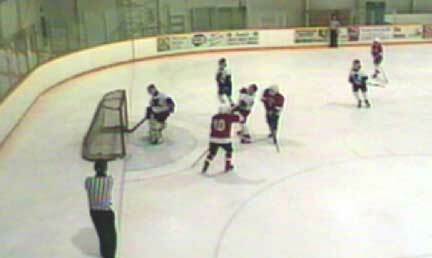 This picture shows Tisdale scoring their first goal as the ring can be seen as it hits the back of the net. 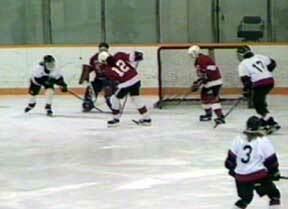 Tisdale had moved the play around so that Leroy's goalie, Nicole Taphorn was caught on the right side of her net. In general she is a post goalie giving little openings to the opposition and stays on her feet. 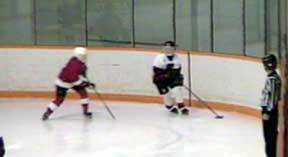 keeps her in the play and she really cuts down the angles with both posts and the cross bar in three consecutive shots before this, the first goal scored on her last night dribbled over the goal line as it got by her stick side. Chantelle Gagnon is carrying the ring at this point after having executed a perfect step turn. If you haven't had the chance to watch a Ringette game in person come out and see what it is like. This past weekend the Tisdale team sponsored a tournament in Star City.